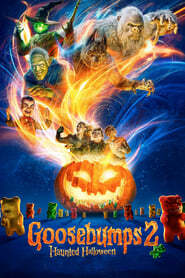 Goosebumps 2: Haunted Halloween is a 2018 Adventure Comedy Fantasy Family Horror movie directed by . It stars Jeremy Ray Taylor, Madison Iseman, Caleel Harris, among others. Goosebumps 2: Haunted Halloween is currently rated 5.6 stars on the ReelBugs scale. Me: 0:45...isn’t that the house from IT? Me In My Imagination: What is R.L Stine wrote a book about PennyWise......? Wait Does Anyone remember The invisible boy revenge something at the end of the Movie The first Goosebumps Movie?? Should be called "Slappy's Revenge"
First , it was looking like a fake trailer combined with goosebumps 1 and IT. But it is Real!!!!!! Kinda upsetting the old cast isnt here, and it doesnt make sence from the last one for a part two. I liked the 1st one better. This honestly feels more like a teaser trailer. Mainly due to the fact that half of the trailer consisted of footage from the first movie. (edit) and olso this dos not add up to the last movie what so ever. Typically jumanji with better version. Nice, but where’s Zack, Hanna, Champ, and R.L. Stine? "Viewer beware, you're in for a scare"
Writer: So, people like our movie Goosebumps, right? Writer: Well, what if we just copied the entire plot from that movie, but with different actors, so it looks like a new movie! They should have set the movie in the 90s like the REAL books. This movie's set in 2018, which isn't like the originals at all. quem veio pq vai passar na globo domingo? This felt like a Disney Channel special from the 90s.